We have been posting versions of Adon Olam from all over the world, 43 so far. Every week we search the Internet for new interpretations of this classic Shabbat morning hymn. And today we're posting our 44th Adon Olam, this one from the Leo Frankel Synagogue in Budapest, Hungary. 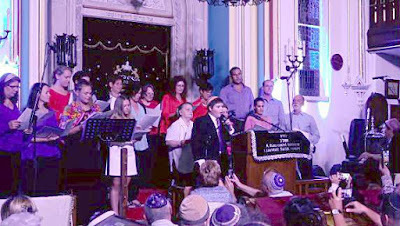 The occasion was a festive concert on September 3, the 130th birthday of the Synagogue. There are 400 seats in the synagogue that was built in 1888. In the 1920’s a block building was built around it to protect it. It's a Neolog synagogue which is the mainstream denomination in Hungary. It’s somewhere between Conservative and Modern Orthodox. – Men and women sit separated but without a mechitzah. – It is not egalitarian: women are not counted to the minyan neither called for aliyah. – Most congregants celebrate rather than keep Shabbat. And they are very enthusiastic, as you can see from the joyous singing of Adon Olam. A Joke to Start the Week - "Tel Aviv Taxi"